Lockheed Martin beats Wall Street's earnings per share expectation by 83 cents. The defense contractor also raises its forecast for full year 2018 earnings to about $17.50 a share and says it expects revenue to climb 5 percent to 6 percent in 2019. Lockheed Martin on Tuesday reported third-quarter earnings that beat Wall Street expectations and said it expects a strong finish to 2018. The defense contractor raised its forecast for full year 2018 earnings to about $17.50 a share, above its previously forecast range of $16.75 to $17.05 a share. It also said it expects revenue for 2018 to come in at $53 billion, at the top end of its earlier forecast. In an early forecast for 2019, it said it expects revenue to climb 5 percent to 6 percent from 2018. "The preliminary outlook for 2019 assumes the U.S. Government continues to support and fund the corporation's key programs," Lockheed Martin said. Lockheed Martin beat Wall Street's earnings per share expectation by 83 cents with adjusted third-quarter earnings of $5.14 a share. The contractor's revenue of $14.32 billion in the third quarter was also better than expected, with Lockheed Martin reporting about 16 percent more revenue than the $12.34 billion reported a year earlier. 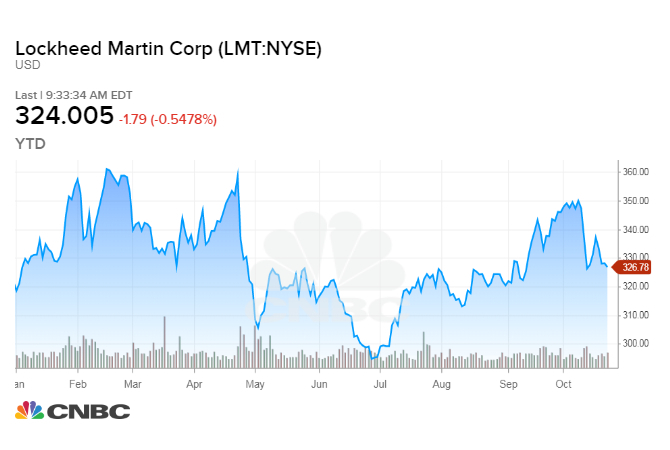 Lockheed Martin shares fell 0.6 percent in trading. The stock is up slightly this year, rising about 1.8 percent as of Monday's close of $326.78 a share.